This species is accepted, and its native range is Mexico (Nuevo León to Oaxaca). Echinocactus aulacogonus var. diacopaulax Lem. Echinocactus helophorus var. laevior Lem. Echinocactus helophorus var. longifossulatus Lem. Echinocactus ingens Zucc. ex Pfeiff. 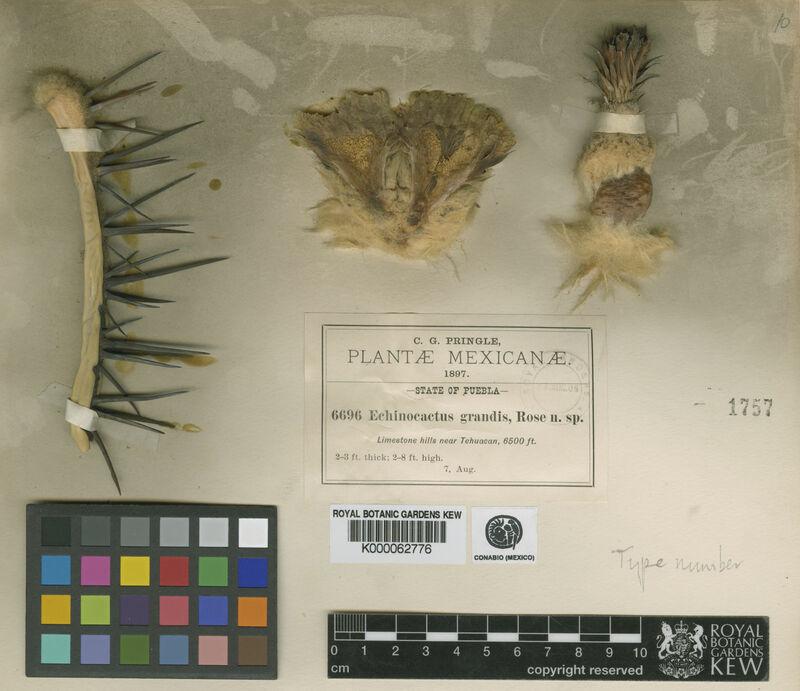 Echinocactus ingens var. helophorus (Lem.) K.Schum. Echinocactus ingens var. saltillensis (Poselg.) K.Schum. Echinocactus ingens var. subinermis K.Schum. Echinocactus ingens var. viznaga (Hook.) K.Schum. Echinocactus karwinskii Zucc. ex Pfeiff. Echinocactus minax var. laevior Lem. Echinocactus oligacanthus Mart. ex Pfeiff. Echinocactus tuberculatus var. spiralis DC. Melocactus ingens Karw. ex Pfeiff.